Androgenic alopecia is the primary cause of hair loss worldwide. Known as male pattern hair loss in men and female pattern hair loss in women the condition has sparked the age-old dilemma of hair loss. Previously, patients would turn to either monoxide and finasteride; however, both medications have their downsides. As time progressed, modern treatments have emerged that are not as much of an inconvenience as traditional treatments to cure baldness. Androgenic alopecia is hair loss that results from the existence of two factors: increased testosterone levels and androgen-sensitive follicular units. In men, the condition follows a pattern usually a thinning crown and stable growth in the back of the scalp. The secret behind the notorious pattern of hair loss relies on the androgen-sensitive properties in individual follicular units. Hairs in the crown and hairline tend to be androgen-sensitive and tend to shed prematurely. Whereas hairs in the back are androgen resistant and stand immune to DHT attacks. Since the hair in the back is resistant to hair loss, males suffering from hair loss from androgenic alopecia are illegible for hair transplantation. Surgeons label the hair growth regions as stable donor areas from which donor hair will be extracted and relocated to bald areas. Upon relocation, follicular units do not lose their anti-androgen properties and continue to perpetuate growth in previously bare areas. In women, the condition is harder to treat with hair transplants than men. In order for hair transplants to fit the case one essential condition need to exist: stable donor regions. 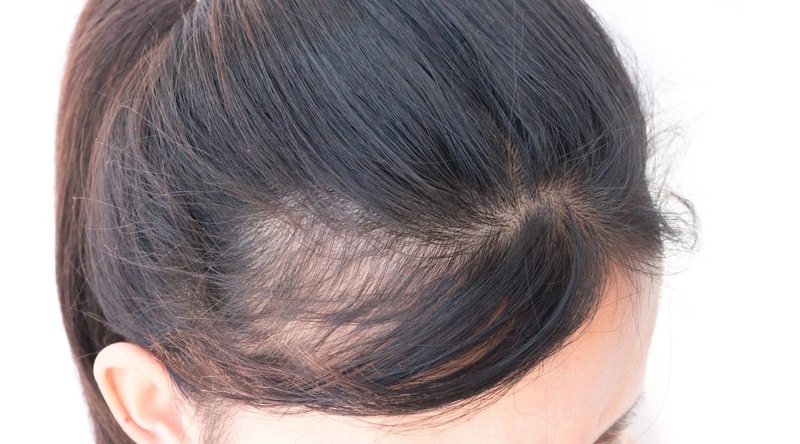 Since in women, androgenic alopecia does not take on a particular pattern and is more diffuse women who suffer from androgenic alopecia do not make for suitable candidates for hair transplants. However, a recent treatment that goes by the name PRP therapy replaces both finasteride and monoxide. PRP therapy is short for platelet-rich plasma, which is a component found in blood and is a reservoir of crucial growth factors. To extract PRP from patients, a nurse first draws blood from the patient the standard way and then subjects the tube for centrifugation. The high-speed rotations separate PRP from the remaining components to later be injected in the scalp of patients who suffer from androgenic alopecia. PRP contains growth factors which are proteins that bind to cells and trigger a cascade of signals leading to proliferation and growth. With androgenic alopecia, in particular, growth factor production decreases in follicular units. With the injection, follicular units receive a boost of growth factors. Contrary to finasteride and monoxide, patients do not have to inject PRP daily. Instead, it is one session per month and patients may need anywhere from one to eight sessions depending on the degree of hair loss.